"This banana bread is sweetened with maple syrup and spiced with cinnamon and nutmeg for the perfect fall treat." Preheat the oven to 350 degrees F (175 degrees C). Grease a loaf pan with nonstick spray. Combine flour, baking soda, cinnamon, salt, and nutmeg in a bowl. Set aside. Mash bananas until mostly smooth but some chunks remain. Add eggs, oil, maple syrup, sugar, and vanilla extract; mix with a wooden spoon. Add flour mixture and walnuts. Mix just until flour is moistened. Pour batter into the prepared pan. Bake in the preheated oven, rotating pan halfway through, until a toothpick inserted into the center comes out clean, 55 to 60 minutes. Cool on a wire rack for 10 minutes. Invert bread onto the wire rack to cool completely. 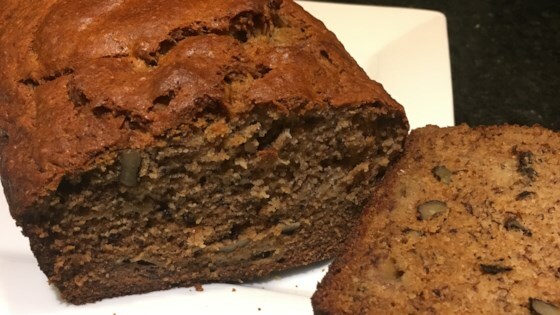 Discover the secret ingredient to a gluten- and grain-free banana bread. Turned out great. Made into mini loaves just shortened cooking time to 23 mins. Not impressed with this recipe. There’s nothing particularly bad about it, I’m just not fond of the flavour & will stick to a more traditional banana bread going forward which I know & love. This bread is sooooo good! Perfect for a rainy fall New England morning. Bonus points for my 8 yo eating it with no complaints! Thank you!! This was very easy to make and quite delicious. I like a bit more banana flavor so next time I will add another banana. Was better the next day after refrigerating, but preferred my old old standby banana bed recipe.